In a matter of days the crew from Southern Methodist University would pack its handiwork and drive to the Smithsonian National Museum of Natural History for the "Sea Monsters Unearthed" exhibit. 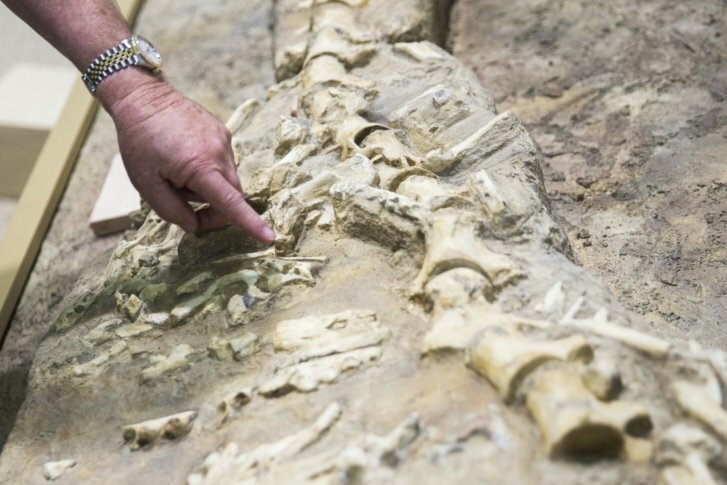 DALLAS (AP) — Three weeks before his team’s fossil finds were to go on display at one of the world’s most famous natural history museums, Louis Jacobs stood in a basement lab at Southern Methodist University sanding the lower jaw of a 72-million-year-old sea monster. The Dallas Morning News reports his colleague Michael Polcyn sat nearby, dabbing sealant on a model of the animal’s upper jaw and skull. White dust hovered in the air. Plaster tailbones, skulls and teeth topped every counter. That was the sort of work — preparing models and fossils — that Jacobs had done early in his career, before he became a professor, before he hunted for fossils in Alaska, Antarctica, Malawi, Cameroon and Texas; before he dug up the bones of dinosaurs on display at the Perot Museum of Nature and Science in Dallas; before he wrote three books and dozens of peer-reviewed papers. “Because of the way I came into paleontology, I didn’t have a staff like this guy,” says Polcyn, a self-taught paleontologist who helped build and sell a telecommunications company before he joined the staff at SMU. Polcyn adds that Jacobs did more fossil work when he was younger. “Before I grew old and lazy,” jokes Jacobs, and the two laugh. Then Polcyn turns serious. “We’ve never put an exhibit of this scale together,” he says. Jacobs and Polcyn, along with a small coterie of staff, students and volunteers, had been working tirelessly for months getting ready for the biggest show of their careers. Next door, volunteers pour bronze-colored molds of teeth and jaws that visitors will touch. One floor up, colleagues line acrylic cases with black felt to cushion and display bits of snout and vertebra like diamond rings in a jewelry store. In a matter of days the crew would pack its handiwork into a rented truck and drive it 1,300 miles to the Smithsonian National Museum of Natural History in Washington, D.C. Soon the museum’s “Sea Monsters Unearthed” exhibit will showcase fossils that Polcyn, Jacobs and an international team of scientists found along the coastal cliffs of Angola in West Africa between 2005 and 2016. The finds date from about 88 million to about 72 million years ago, starting after Africa and South America drifted apart and opened the southern Atlantic Ocean. Their quest was to learn about the first life-forms that moved into the South Atlantic, to trace how they diversified and how the land continued to change around them. The clues they uncovered tell the story of how our planet shapes the creatures that inhabit it — including us — and links back to Texas’ own prehistoric past. “Have you ever seen one?” he asks, sitting on this day in his office in jeans and a plaid shirt. “Where’s your rat tooth when you need it?” he says. “You see how pretty it is?” he asks. After graduate school, Jacobs took his first trip through Africa and met the anthropologist Richard Leakey. Leakey, then director of the National Museum of Kenya, hired Jacobs to head its division of paleontology, which housed the Leakey family’s landmark finds of human ancestor fossils. For two years Jacobs lived in Nairobi with his wife, Bonnie, leading dignitaries through the museum’s collections. Giraffes grazed outside the windows of their suburban home. “Every outlander who has ever gone to Africa has taken a part of it away and left something behind,” he wrote in “Quest for the African Dinosaurs” in 1993. Jacobs wanted to leave behind something beneficial, always returning fossils to the countries where he had found them, training their graduate students and helping establish museums. In the 1980s and ’90s, he led expeditions to the tiny East African country of Malawi and joined expeditions to Cameroon. In Malawi, his team found a trove of long-necked plant-eating dinosaurs and traced their relatives all the way to Texas’ Big Bend National Park. Both long-necked species — the Texan and the Malawian — now loom over visitors at the Perot Museum. Jacobs’ colleague Polcyn, who specializes in extinct lizards called mosasaurs, was a driving force behind the recent expeditions to Angola. “You didn’t know that?” asks Jacobs about their 98-million-year-old find. “What, were you tellin’ all your friends that we were just a bunch o’ rubes?” Everyone laughs. Jacobs and Polcyn have also studied mosasaurs, sea turtles and plesiosaurs, marine reptiles on which the legend of the Loch Ness monster is based, throughout North Texas. They date from between 96 million and 70 million years ago, when our area lay beneath a large inland sea (see map). 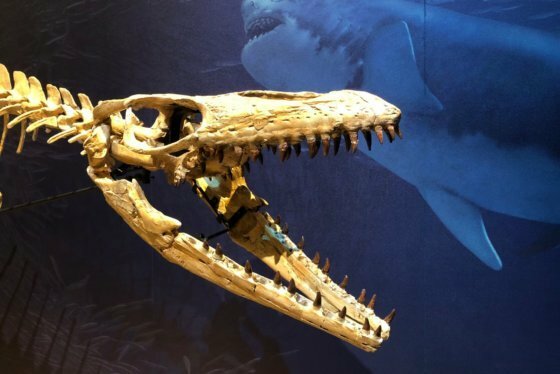 Now they wanted to find out what happened to marine reptiles as the southern Atlantic Ocean began to open about 120 million years ago, when the southern supercontinent of Gondwana split into what is now Africa and South America, connecting the South Atlantic Ocean with the northern oceans about 90 million years ago. “We wanted to know what happened when you put a new ocean where there wasn’t one before,” said Jacobs. He explains that the theory of plate tectonics — the idea that continents sit atop plates that are constantly shifting — wasn’t accepted until the mid-1960s, after Angola’s war for independence broke out and blocked scientists from doing field work there. “It was like a museum in the ground,” said Jacobs. Inspecting a hillside in 2006, Polcyn noticed some vertebrae sticking out of a rock. It turned into one of the expedition’s biggest finds and forms the centerpiece of “Sea Monsters Unearthed”: a large mosasaur with three partially digested mosasaurs in its belly. Polcyn and his team used a combination of laser-scanning and 3D printing along with traditional mold-making and casting to build a 23-foot-long model of the large mosasaur’s skeleton. He and colleagues also produced a cast of the field site so visitors could see how the bones looked when they were still in the ground. While Polcyn can’t say how the predator died, the evidence shows that once it fell to the bottom of the sea, sharks and other fishes scavenged it, leaving telltale tooth marks on its bones. Mosasaurs evolved from relatively small land-dwelling lizards that entered the oceans about 100 million years ago, during a time of intense global warming and high sea levels. They spread through the world’s oceans and migrated into the South Atlantic after it opened, around 88 million years ago. They then diversified into the new species that Jacobs and Polcyn discovered. The fossil-laden truck from SMU arrived in D.C. on a Sunday night, driven by one of Jacobs’ former students. The scientists unload it early the next morning and spend the week before Halloween assembling plesiosaur paddles, attaching skulls to bodies and installing the exhibit behind locked doors on the Smithsonian’s first floor. The show, which will open just six months after Jacobs’ retirement from SMU, is special to him for many reasons. As an educator, he marvels at the Smithsonian’s reach: 7 million visitors per year, as Jacobs and Polcyn keep reminding each other.